Crazy hair high-five 5am team! I’m going to try to keep these posts a bit snappier as the last one was a monster. That was about the joys of using group text chat rather than boring old email and as I said we’re using Facebook Messenger. Messenger also supports video chat between two or more people and this as been really helpful recently while guitarist/analog echo addict Krazi was living back in Wales. 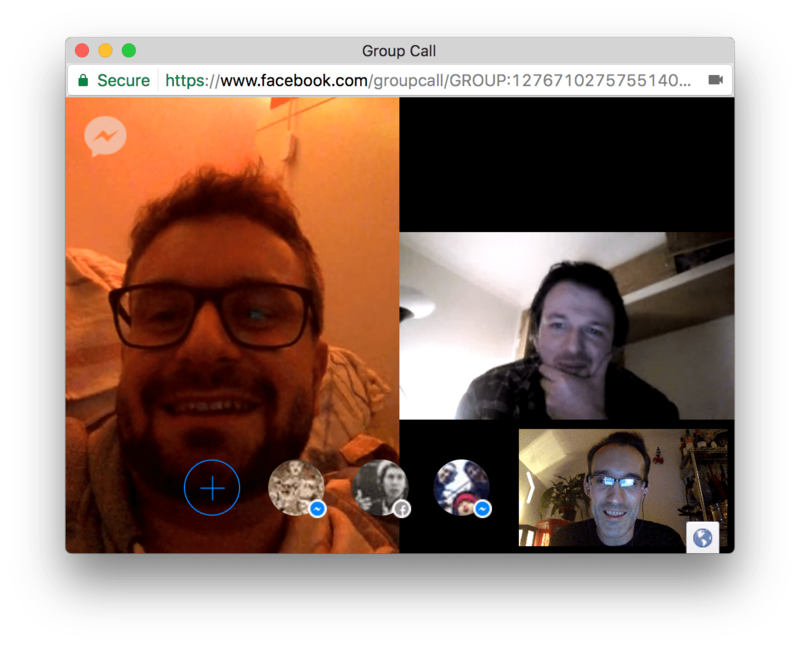 It took quite some encouragement to get the band to try it but it’s now paying off as we when we need to discuss something in a bit more depth than just text will allow, we message round to find a time and kick off a video call. Starting a Facebook video chat is dead easy. You’ll need a computer with a webcam and The Inturrnet, or a smartphone with the Facebook Messenger app installed. You’ll need a chat group – Facebook calls it a Conversation – with all the people you want to call. Get some headphones as these help avoid feedback and echoes on the call. Phone earbuds work fine for me. at the top-right of the chat window to start the call. It’s ringing! People in that Conversation can then join and leave the video call as needed. If you need more help here’s a WikiHow article and the spartan Facebook guidance. UPDATE: We found Facebook video chat started to get choppy with five people. Skype is looking more reliable for us, and there’s Google Hangouts too which has the advantage of letting you wear silly masks and glasses, but we haven’t tried it for the band as yet. Both of these have smartphone apps too. Give it a go folks. You have nothing to lose but your endless email threads! Peace and schlub, Chris FoH.